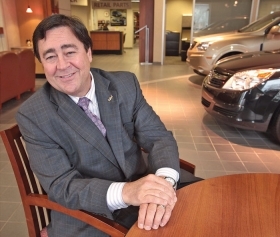 Detroit-area dealer Carl Galeana says opening a Fiat store, in an area with many Italian-Americans, will be a good transition from his Saturn days. "We know all about customer care, being available 24-7." • Chrysler plans about 165 Fiat dealerships in 119 U.S. markets. The first wave of dealers received notification last week. • Chrysler is still studying franchise proposals, including some from non-Chrysler dealers. • Fiat franchise agreements will be separate from agreements for other Chrysler Group franchises. • Some dealers will sell Fiats in interim facilities, such as used-car stores, while they plan permanent dealerships. • The Fiat 500 goes on sale in January, but the main market launch is in March. • Four Fiat 500 models are planned. Many Fiat dealerships probably will get Alfa Romeo franchises when sales start in 2012. Austin, Texas, dealer Nyle Maxwell will deliver Fiat 500s to customers on an elevated runway modeled on those found in the fashion houses of Milan, Italy. Joe Laham was so excited about Fiat, he gambled and paid $1 million for a parcel of land next to his existing Chrysler Group store in Hyannis, Mass., where he'll build a Fiat dealership from the ground up. Carl Galeana will open his Fiat store in his old Saturn dealership in suburban Detroit, in an area where many Italian-Americans live. Three dealers, three radically different approaches. Maxwell, Laham and Galeana are among a small group of dealers selected by Chrysler last week in the first wave of Fiat dealer appointments. In soliciting proposals from its dealers for Fiat franchises, Chrysler asked them to be creative. Maxwell, Laham and Galeana took the company at its word. The dealers see themselves as part of a vanguard that will bring a new kind of young, fashion-savvy customer to Chrysler. "We are going to be the forefathers to plant the seed for the future growth of our company, both Fiat and Chrysler," Laham said. The three dealers discussed their plans last week. The Domain in Austin is no dealership row. Rather, it's a high-end, mixed-use retail, residential and office development. And that's where Nyle Maxwell plans to open his Fiat of Austin showroom. The Domain is populated by upscale clothing stores and gourmet restaurants; retailers include Neiman Marcus and the Apple Store. Said Maxwell, owner of the Nyle Maxwell Family of Dealerships: "This is an aspirational area. People driving into The Domain area, they come to shop and eat in the upscale restaurants and to feel good about where they're at. And we want to be part of that." Maxwell, who owns two full-line Chrysler stores and a GMC dealership in the Austin area, has rented a 6,000-square-foot retail space for his Fiat Studio, the name Chrysler has chosen for the showrooms. Luxury loft apartments are on the floors above the store. "We didn't have some traditional space to move into, and we wanted to do something special and create a buzz and do what we think the Fiat brand deserves," Maxwell said. "We felt this would warrant this somewhat unusual space." The centerpiece of the showroom will be an elevated runway; cars will be driven down it as they're delivered to customers. "It will be a runway similar to what you see in the fashion capital of the world in Milan. That's what we're patterning it after," Maxwell said. The employees won't be called salespeople. They will be called "design consultants," and their job will be to help customers personalize their vehicles. The showroom will have space for about four cars. Initially, cars will be serviced at one of Maxwell's Chrysler stores. He has not decided whether he'll keep the Fiat showroom at The Domain permanently. Chrysler will require him to build a full Fiat dealership within two years, including showroom, service and parts. "We are very aware of that necessity," Maxwell said. "If The Domain storefront is successful enough, we may have both. We are the only Fiat franchisee in the Austin market." For now, the storefront location for Maxwell's Fiat Studio is an interim step that he thinks will be a good way to introduce Austin customers to the brand. Joe Laham decided to skip all intermediate steps for his Fiat store in Hyannis. He was so optimistic that he would get a Fiat franchise, he spent $1 million several months ago to buy a parcel of property next to his Premier Cape Cod Chrysler-Dodge-Jeep-Ram dealership in Hyannis. Laham's bet paid off. Last Wednesday, he learned that Chrysler had selected him for one of three initial Boston area Fiat franchises. Unlike some dealers who won Fiat franchises in the initial round of appointments last week, Laham is not going to take a gradual approach. As soon as he signs his letter of intent and gets the franchise, he will bulldoze a structure and build a dealership on the vacant lot from the ground up, complete with showroom, offices and service department. "It makes no sense to do this in three stages," said Laham, who speaks with a pronounced Massachusetts accent and whose enthusiasm is infectious. "We're not going to build just a showroom; we're going to build it out and get it done. We're going to build a longer showroom than the minimum requirements." Laham's approach means he might not have his building ready when the Fiat 500 small car is launched in North America in March. Also this year, Laham spent $2.2 million to upgrade Premier Cape Cod to meet Chrysler's latest standards. He realizes he took a risk spending the additional $1 million for the lot next door, where the Fiat store will go. "In any business, you got to accept a little risk to get the reward." He is confident that his reward is coming. "Look at when BMW brought in Mini," Laham said. "If you talk to any BMW dealer who has Mini, he has a big smile on his face. Here's a Chrysler dealer who has a big smile on his face. "If we do this right, this could springboard us throughout the whole Chrysler organization." Unlike Laham, Carl Galeana already had a dealership waiting for a new franchise. The owner of Galeana Automotive Group in suburban Detroit will open his Fiat store in his Saturn of Lakeside store, which closes Sunday, Oct. 31. "I'm going to shut down with a Saturn key and open with a Fiat key," said Galeana, who also won a Fiat franchise for his Fort Myers, Fla., dealership, which sells Chrysler, Dodge, Jeep, Ram and Kia. As part of his proposal, Galeana submitted statistics showing that Macomb County, where his Fiat store will be, has a large population of Italian-Americans. He plans to network with Fiat owner clubs, some of which still exist even though it has been more than two decades since Fiats were sold here. For Galeana, the Fiat opportunity bears an uncanny resemblance to the launch of Saturn. He got in on the ground floor when that brand debuted in 1991. "We know all about customer care, being available 24-7," Galeana said. "If you had a problem, you wouldn't have to wait." Galeana thinks the Saturn experience of his longtime employees will translate well to Fiat's approach to personalized service. He hopes most of his 25 or so employees will continue there. "It's great timing," Galeana said. "For me, it was simple. I've got a lot of employees whose jobs are saved. These are like family people. We've been together a long time and now get to continue, just with different clothes."